So here it is, at last! I luuurve my new blouse, it’s everything I wanted! After all the fuss & hassle I think I have something I can work with, put in different sleeves, add collars & mess with the shoulder line. Overall, this is perfect! The print is just right, I don’t like them too big, or too busily small either. 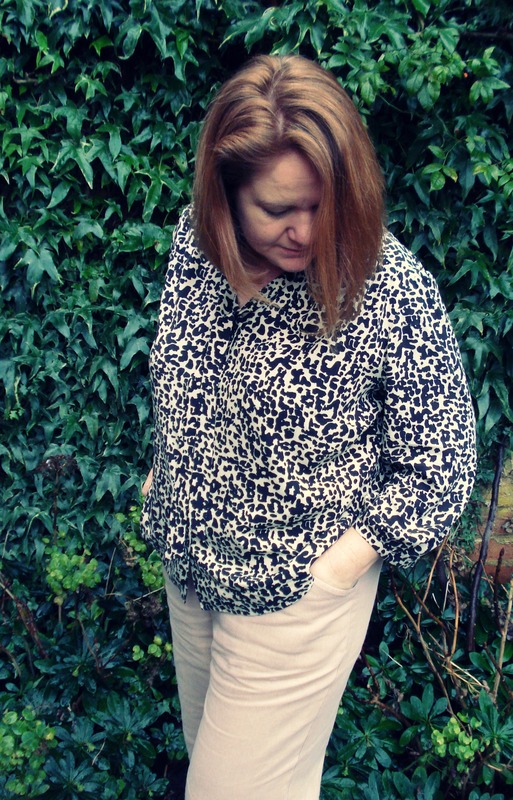 (I sound like Goldilocks…) I even found a photo today of another blouse in the same fabric, it’s on my Wardrobe Architect Pinterest board 🙂 The colours will go perfectly with my current & future trousers & jackets. So what did I do? I moved the shoulder seam on the back forward 5cm so from the front it looks like there is a shoulder yoke. I transferred some of the fullness from the shoulder dart into a 4cm underarm dart & converted the remainder into gathers to go into that “yoke”. I eliminated the waist darts on the front & back & took in the side seams one extra cm so it wouldn’t be too unshaped on the sides. I drafted a grown-on facing for the front v-neck & instead of a collar, made a long narrow tie to be sewn onto the back neck & left free from the shoulder seam. 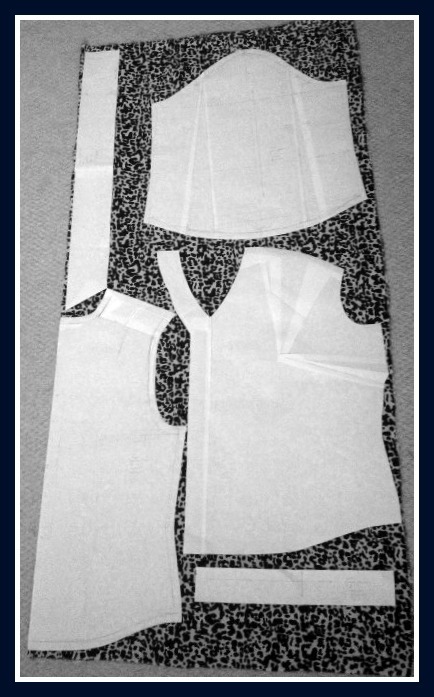 For the construction, I used French seams throughout, little squares of interfacing under the buttons & buttonholes & double turned hem. I didn’t want any part of the blouse to have structure, keeping the nature of the viscose to drape & hang. Now I am full of ideas of how to use this as a basic pattern from which to make all sorts of variations. Problem is, I’m pretty sure I need to go fabric shopping because most of my fabrics are meant for the girls, not me! This could cause a bit of a problem as I signed up for the big stashbusting effort with Lelie from Bouquet of Buttons. I did fairly well with my stashbusting efforts last year, but I still have plenty to get through. I will do the same as last year, using 2 pieces from the stash before being “allowed” to buy one new piece. Unfortunately this leopard print is not from the stash! 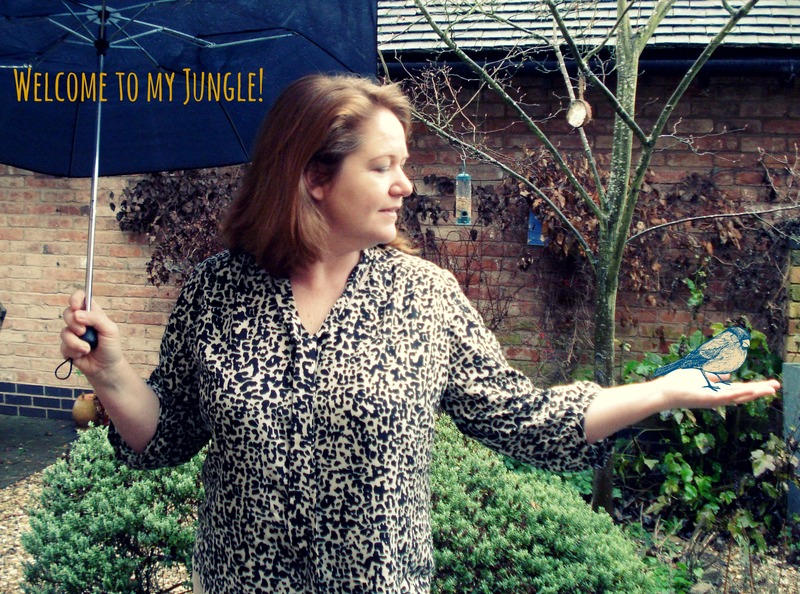 I bought it this year specifically for the Jungle January project. 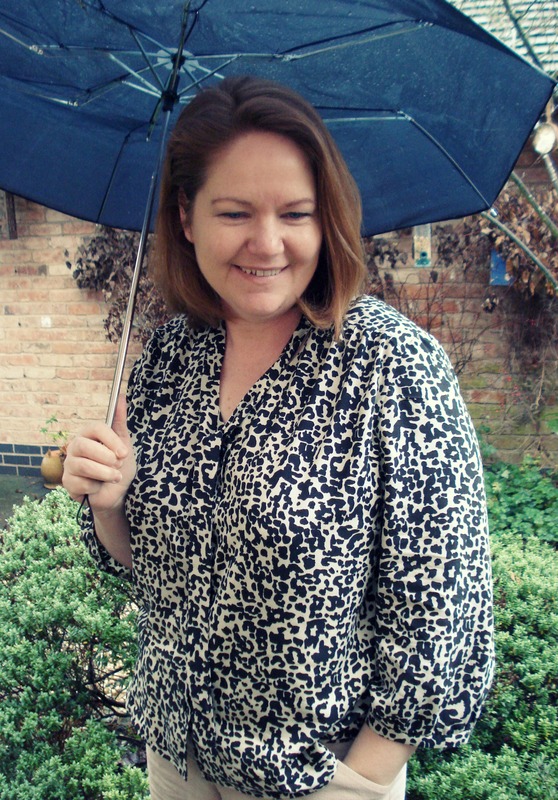 Well, this blouse is a slap in the face for the January Blues! It’s just gorgeous! Just the most perfect blouse and fabulous fabric. Definitely worth the work. You look just fabulous. Definitely worth the effort and perseverance! It looks wonderful! 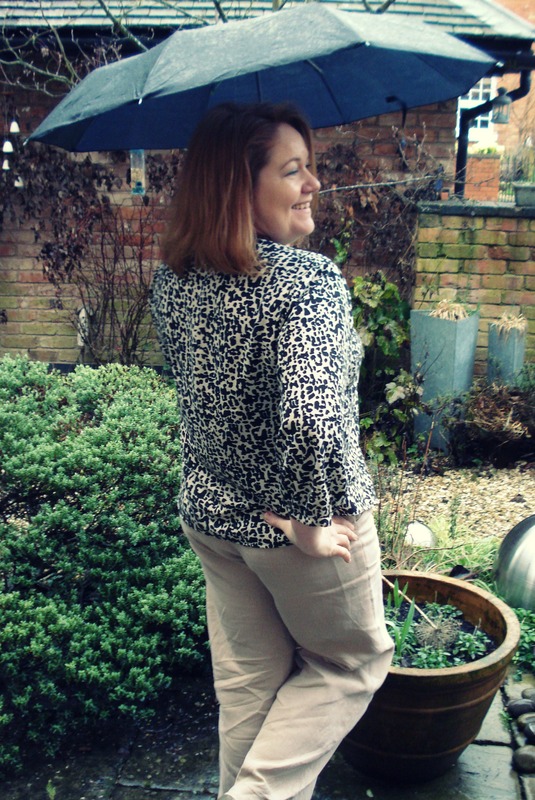 Well this is just a darling blouse! I love the small print. 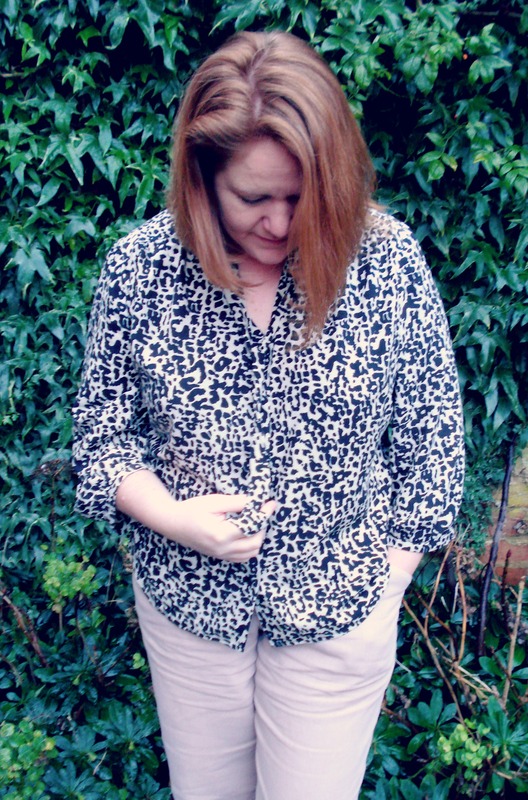 I’m blaming Anne for getting me wearing an animal print, too, because it’s not my comfort zone. But your blouse is subtle with a wink-wink cheekiness that’s perfect. Love the colors… it looks perfect with your slacks! And the changes that you made to the pattern are pretty neat too! Nice make! Now this is my sort of blouse. I love the changes you’ve made and thank you for the details because I’ll be coming back here to re-read. Perfect print and style and all. That looks so great on you! Love the colours, love the fit! Smashing blouse, I love a happy ending! I really love your blouse. You had loads of trouble with your fabric – but it’s turned out well in the end! Now what to do for “Ferocious February”? ?